The only thing that feels better than holding a hot drink in your hands on a cold day is holding a hot drink wrapped in fabric. The paper drink sleeves are good, but when you start using a fabric sleeve, you’ll never go back. 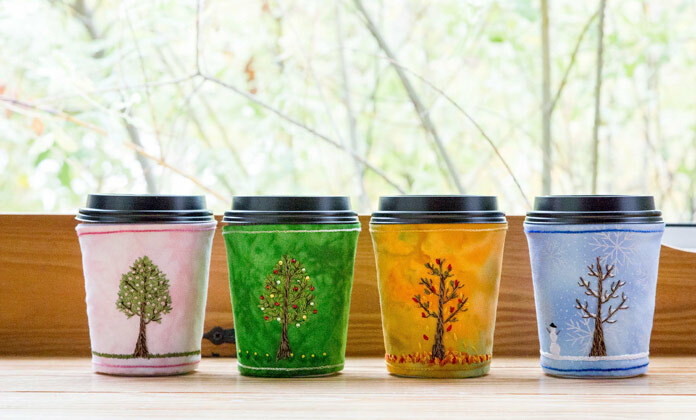 This project gives you one sleeve for every season and they are for hot or cold drinks. Make one or all four using your choice of fabric and threads. The stitches used can be found in most stitch books or online. The sleeves are reversible so pick a fun fabric for the back. This is a great gift idea for anyone who drinks coffee or tea on the go.